For the past several years, subway customers have benefitted from the features offered by the MTA’s vast network of The Go Travel Station (OTG) kiosks. With the convenience of interactive touch screen operation and digital clarity, the OTG’s have revolutionized the delivery of travel information within the subway system. Now, the On The Go Travel Station kiosk network has gone outside, in Williamsburg, Brooklyn. The installation of Waypoint style exterior units marks the first street side roll out of the interactive kiosk network. 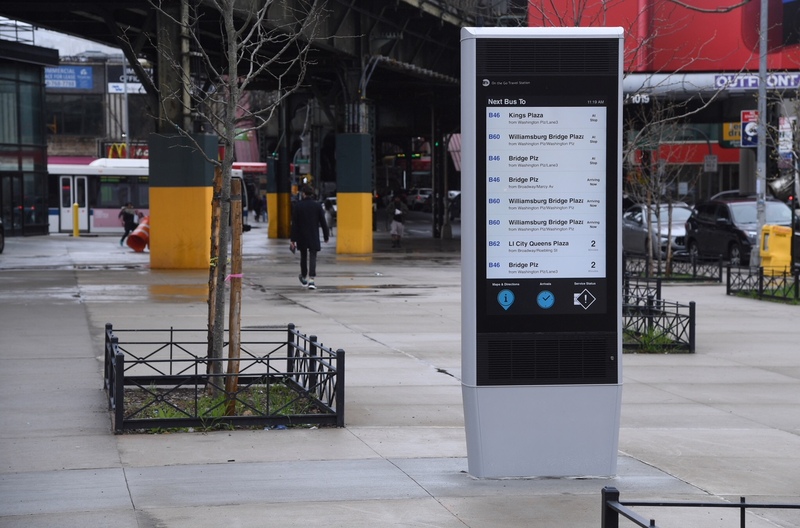 Four exterior Waypoint On The Go Travel Station interactive digital kiosks have been installed and activated at Williamsburg Bridge Plaza Bus Terminal, home to 10 different Brooklyn bus routes within and adjacent to the terminal. 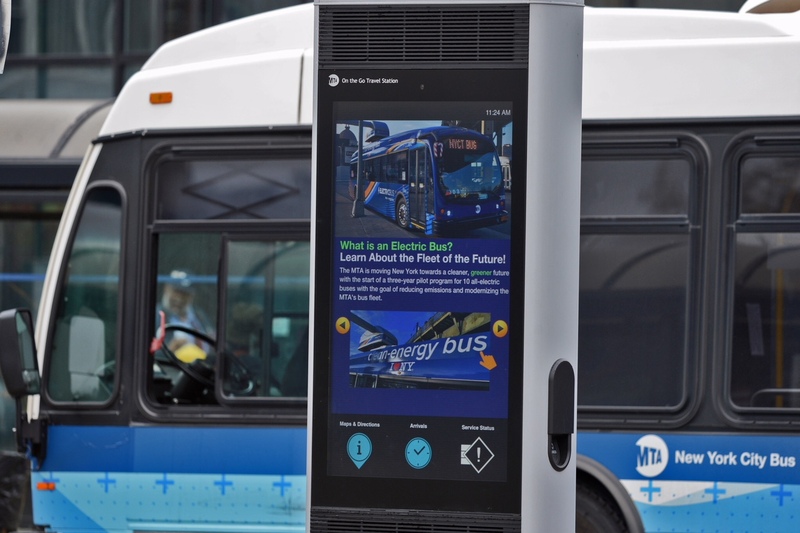 The installation was a collaborative effort among NYC Transit Department of Buses, NYC Department of Transportation and the OTG team at NYC Transit. Riders can now determine how far away their bus is from the busy terminal, located at the foot of the Williamsburg Bridge in Brooklyn. Armed with the information, customers can decide to wait at the terminal or run a quick errand at nearby shops. Bus riders transferring to the nearby Marcy Av J, Z and M subway station can also check Subway Time arrival information before leaving the terminal. In addition to arrival information the kiosks also display bus courtesy, bus safety and other agency messaging. Customers can also check Elevator & Escalator status, Service Status and plan a subway trip. There are no commercial advertisements. on Wed., April 25, 2018. The 55” units, manufactured by Civiq and running on the Intersection OTG platform are strategically spread out across the plaza. One unit is situated near the new B61 Electric Bus station at Roebling Street & Broadway. Another unit was placed on the Select Bus Service B44 bus island and one kiosk has been installed on the B46 bus island. The fourth, a double-sided unit, is located just off Broadway & Havemeyer Street near the customer waiting room and the pedestrian entrance to the bus terminal. Each unit also has USB charging ports. In addition to Bus Time arrival information the kiosks also display Subway Time arrival information for the nearby Marcy Av J, Z and M lines, bus courtesy and bus safety messaging. Customers can also check Elevator & Escalator status, Service Status and plan a trip. There are no commercial ads. The four units are the first dedicated to serving some of the bus network’s 2.1 million average daily customers. There are 411 OTG kiosks installed in more than one hundred stations across the NYC subway network used by 3.1 million average daily riders. The OTG network was rolled out as part of a five-year public-private partnership between MTA NYC Transit, Outfront Media and Intersection which saw the media companies furnish the kiosks and recoup their investment through the sales of digital advertising.